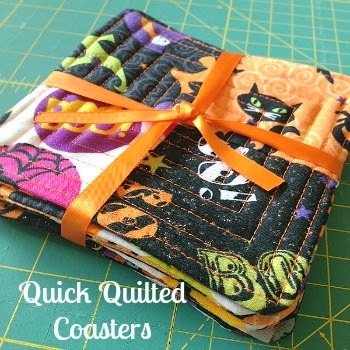 Okay y'all- Tomorrow is my stop on the Sew We Quilt Wicked Blog Hop (not to mention Halloween), so I know things will get pretty busy in a hurry! I wanted to give everyone plenty of time to share what you're working on, either before or after the sugar-induced coma of trick-or-treating! So, I'm posting Needle and Thread Thursday a day early, and I'll still leave it open through Friday! 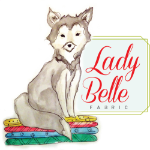 In case you missed it, I have my machine back and am sewing again! Yippee! So, tomorrow, I'm planning to share a little tutorial for the blog hop, and Friday, I have a tutorial ready to go for the braid/herringbone quilt I mentioned in my last post. Be sure to keep an eye out for those! With all of that coming up, I'll just save my NTT sharing for another time, so let's just get right down to the highlights, shall we? Last week, there were SO many fantastic links! I know, I know. I say that every week. Yep, I do. I and I really mean it, but this week I had an especially hard time choosing some projects to highlight because there were lots that I just loved. Jess at Quilty Habit shared this adorable baby quilt, and I just think the little owl is too cute! 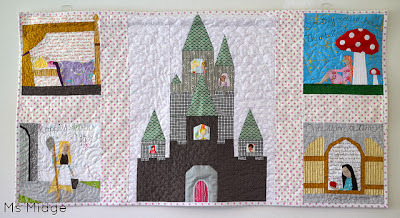 Ms. Midge's paper pieced fairy tale quilt is just amazing! 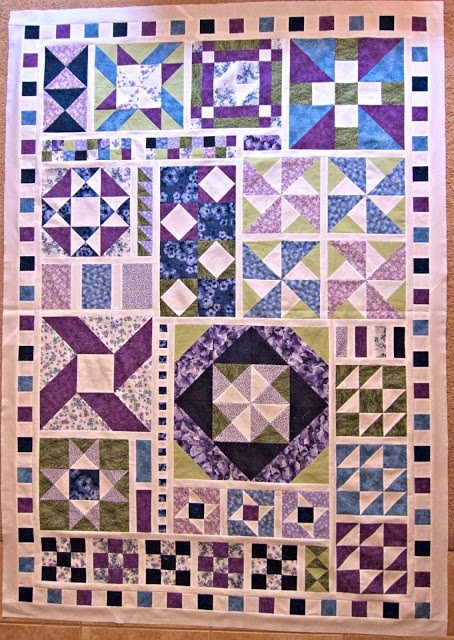 and Diana at Red Delicious Life shared her Accuracy Quilt Along top, and I love the purples! Okay, y'all, you know what to do. Bring it on! Here are the rules. Y'all know the drill! Oh my goodness, friends! I had an appointment on Friday so I was off work, and I took that opportunity to pick up my sewing machine. My dealer is about 30 minutes away, and they close before I can make it after school, so I was grateful for the chance to get there on a day other than Saturday. I was without it for two looooong weeks, and I know I will waste no time getting a backup for the future. I have learned my lesson the hard way. I just love sewing too much! These are mostly Lottie Da fabrics by Heather Bailey, with a few others thrown in. The shop that sells my quilts got this fabric line in a few weeks ago and asked if I would make a baby quilt that would really show it off. They also asked if it would be possible to make the quilt with only fabrics they stock, which eliminated solids. They also happened to ask for this quilt right after I took my machine in, which means it's been sitting on my to-do list for a couple of weeks already. The Giant Log Cabin has kind of become my go-to pattern for a quick, easy quilt that can really show off beautiful fabrics. Since the strips are four inches wide finished, even large patterns stay relatively intact. Oddly enough, even though I've made three quilts in this pattern (because they are really fun to sew), none of them are at the shop, so I figured, why not? I'm planning to get this one basted and finished up to deliver Saturday (hopefully), and I hope they love it! 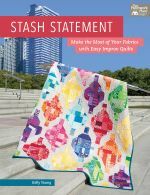 After thinking long and hard about which quilt to enter into the Blogger's Quilt Festival at Amy's Creative Side, I just couldn't make up my mind. The two quilts I had in mind are completely different, and I love both of them! So, since I can enter two, I decided, what the heck! This is my first time to enter and I'm jumping in with both feet! I've decided to enter Feeling Groovy in the Throw/Lap Quilt category. It measures right at 6ox60 inches. I fell in love with Pat Bravo's Carnaby Street fabrics as soon as I saw them and I knew that I needed a special pattern to show them off. I opted for a X-Plus pattern, and it's a choice I'm still glad I made. Instead of making a scrappy quilt with this pattern as I have usually seen, I decided on two shades of gray, Kona Coal, and Kona Iron for the background, to really let the Carnaby Street shine. I love how the grays recede into the background and allow the Carnaby Street to jump out, creating an almost 3D effect. This is also my most favorite quilt backing I've ever made. I didn't want any of my precious scraps to go to waste, so I improv pieced them into a panel, which I think makes the backing as fun as the front! This quilt was so much fun to make, from the fabrics right down to the chevron binding in the perfect shade of teal. 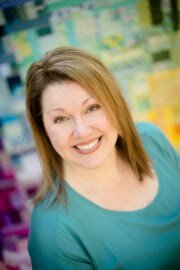 Be sure to hop over to Amy's Creative Side and check out the Blogger's Quilt Festival. 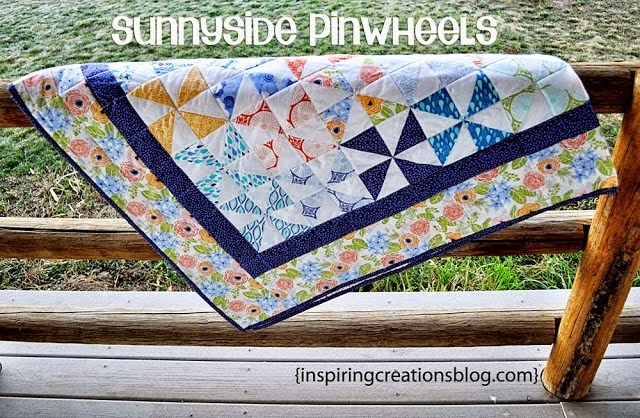 There are so many fantastic quilts linked up, and you won't want to miss it! 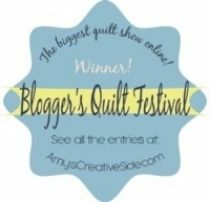 I am so excited to enter the Blogger's Quilt Festival at Amy's Creative Side for the very first time! 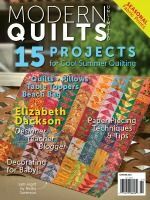 I can't wait to browse through all of the fantastic entries, make some new quilty friends, and get inspired! I absolutely could not decide between two of my quilts, so I decided that since I'm allowed two entries, I'll just enter both! 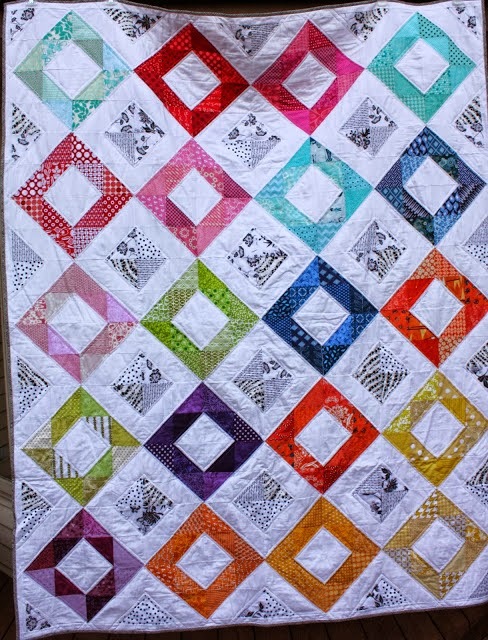 My first entry is my scrappy quilt, Serendipity. Making this quilt was a really special experience for me, because I was able to revisit all of the previous quilts I've made that have gone to new homes. To make the blocks, I took every single scrap I had and just started sewing- improv style. The quilt masures 84 x 96, so it was quite an undertaking to quilt it on my home machine, which is also another reason that I feel so proud of it. It is quilted in a simple meander, which I think fits with the style of the improv blocks and doesn't add too much busy-ness. It took some real muscles to manage the weight of such a big quilt with FMQ on a regular machine! I was able to piece the rest of my improv blocks into the backing to add a little bit of interest there. 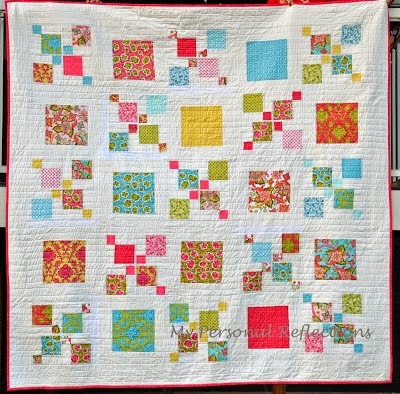 I love the how the lime green polkadots look with the explosion of color in the blocks. With all of the scrappy color, any binding or backing color choices would have worked, but I decided to bind with Kona Purple, and I think it keeps it really bright and fun! The name of this quilt is a reflection of the way the quilt came together. It is a quilt whose beauty was realized from sewing with humble scraps, from sewing in a style that was completely unplanned. The name Serendipity fits like a glove. Size- 84 x 96 in. 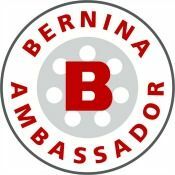 Be sure to check out all of the fabulous entries, and prepare to be inspired! Welcome to another Thursday, friends! The days are getting cooler and the air is nice and crisp around here- perfect quilt weather! I'm still without my machine, but I've decided that whether it's been serviced or not, I'm picking it up Saturday. I have too much to do to be without it any longer! I suppose if they aren't able to do a regular servicing before Saturday, I'll have to take it back after Christmas. I have two beautiful bundles that I simply cannot wait to get into. 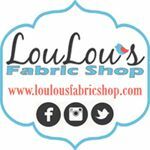 You didn't think I was actually going to stop my fabric ogling just because I'm without a machine right now... did you? Sing While Crafting shared this blue and green beauty! My Personal Reflections shared her fun Impromptu quilt. 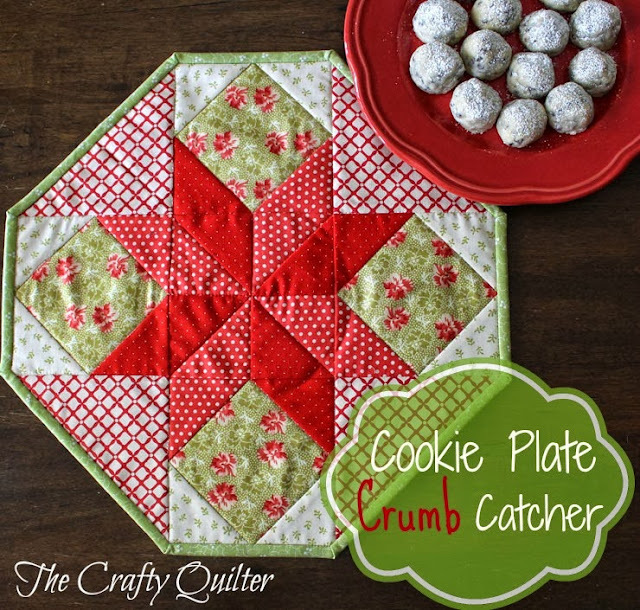 and The Crafty Quilter linked up this adorable cookie plate crumb catcher. Okay, y'all, you know what to do. Party it up! Here are the rules. You know the drill! Well, my Fall Break of leisurely sewing is coming to a close, but not before I finished one final quilt. Yeah, that makes three for the week. 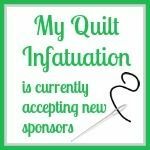 For real- My Quilt Infatuation...it's more than a name. It's kind of a problem. I have to give a shout out to Janet at Simply Pieced. Last month, when she hosted our local MQG meeting, that girl was cleaning out some of her stash! She made this quilt with the Eden's Dream line by Studio E, and decided that she was finished with the fabric. I ended up with almost a full fat quarter of 8 different prints. A girl can always use more fabric, right? Thanks, Janet! I wanted to use this fabric judiciously, so I needed a fairly simple pattern that would create as little waste as possible. I stretched the fabrics by adding some Kona Coal, Kona Baby Blue, and that cute lime green print which coordinated so perfectly! I ended up making some 25 patch blocks and alternating with framed 9 patches. The squares are 2 inches finished. I used Kona Bone and the creamy ivory is the perfect compliment to the soft colors of the fabrics. I quilted with a meander in soft pink, and I just love how it looks against the quilt. I don't see many 25 patches around. Usually, I see either 16 patches or 36 patches, with good reason now that I think of it. You can't speed piece 25 patches in the same way since there is an odd number across. So, to make the 25 patches quickly, I made a 16 patch, then attached a row of four to one side, then a row of 5 down the other side. Well duh! That makes sense, right? I'm a little embarrassed to admit that it actually took a couple of blocks before I started doing them this way. Then, of course it went much faster. I used every single scrap of fabric in the top, so that left none for the backing. That allowed me the freedom to choose a busier print for the backing though, so it's all good! I just love this gray and cream scroll fabric, and I added an offset stripe of blue just to break it up a little bit. The binding is Kona Coal, since I already had plenty of it in my stash. When I first saw these fabrics, the colors immediately reminded me of dawn. The colors are bright, but something about them is soft as well. Maybe it's the gray and cream mixed in? The framed patches give the illusion of looking through windows and peeking out at the sometimes foggy early morning light of dawn. So, I've named this one Discovering Dawn. It measures 50x50. I'm really happy with the way this one turned out, and I'm listing it in my etsy shop! 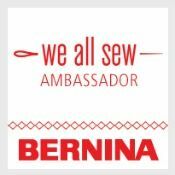 Besides the fact that Fall Break is ending, the other reason that I rushed to get this one finished up is because my beloved Bernina's service light came on. It's a little bit troubling, since I've only had her since April. 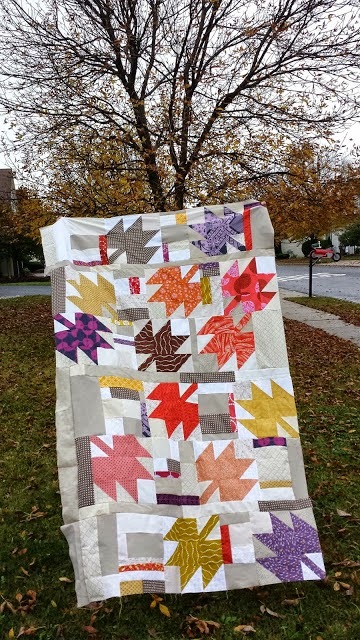 My dealer assures me that she shouldn't need regular service already, but since Discovering Dawn is her 28th quilt, I wonder if that's the case. Even though several of these quilts were baby quilts, I think that's still a pretty big workload for 6 months. I really hope that's it and nothing is actually wrong. Seriously though- what am I going to do for 1-2 weeks while she's gone?